There are an estimated 50,000 amputees inside Syria who are innocent victims. 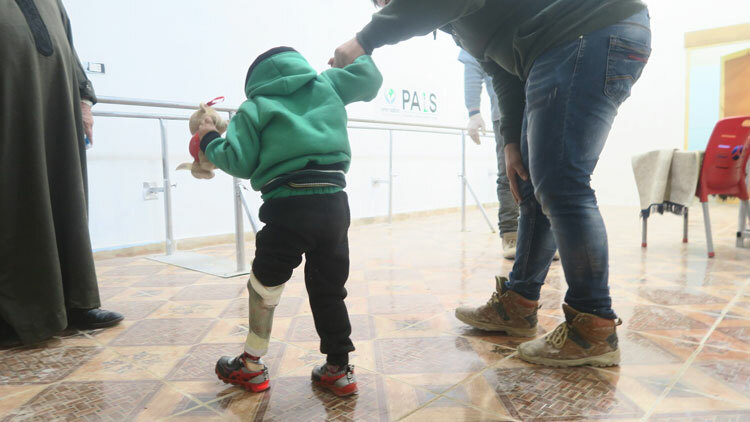 One Nation’s Prosthetic Artificial Limbs Clinic in Syria (P.A.L.S) offers hope for a meaningful life for those who have lost limbs. By returning these individuals to a life of ability, independence and productivity, the whole family they support is often lifted out of poverty and dependence. Sadly, many of the victims are children, with your donations, One Nation has been able to help children in our PALS centre. On average, the PALS centre treats around 30 patients a month who are fitted with prosthetic limbs. These limbs are lightweight and strong with extremely flexible joints, in line with the highest international standards. Treating each patient costs around £1,000, this includes assessments, fitting and rehabilitation. Make that difference today and help change lives. Case 1: Abdal Razaq is a child in Syria who found an explosive which he thought was a toy. While playing, this device exploded and amputated his hands, injured his eyes and face. The trauma this child suffered was unimaginable, he stopped going to school and lost his confidence. He loved playing football and wants to play football again. His dream is to become a footballer. Case 2: A rocket hit Omar`s house. Omar was injured and lost his left leg below the knee. The trauma of losing his leg seriously affected his learning ability. At the age of three, Omar finds it difficult to speak and express himself clearly. He likes to play with his toys which helps him.